The premium quality ingredients for our milk formulas are sourced only from Australia, mainly from the lush, rich, grazing farms of the South Gippsland region in Victoria. 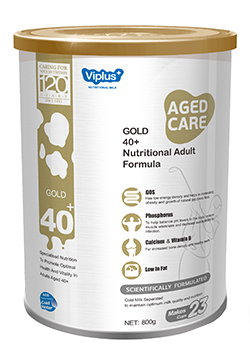 Viplus Gold 40+ Nutritional Adult Formula is scientifically formulated and made by using fresh Australian milk. It contains calcium and Vitamin D for strong bones and teeth and GOS prebiotics to encourage a healthy digestive system. It is low in fat and cholesterol and can help reduce the risk of developing diabetes or liver disease. 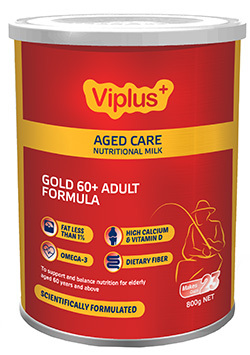 Viplus 60+ Senior Formula is a formulated supplementary drink that has been produced using fresh Australian milk. It contains no fat, high in calcium and vitamin D, may help strengthen bones and muscles. The premium quality ingredients for our milk formulas are sourced only from Australia, mainly from the lush, rich, grazing farms of the South Gippsland region in Victoria. 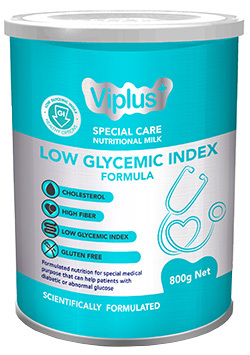 Viplus’s Nutritional Low GI beverage is specially formulated using Gippsland grass fed Dairy Milk. The glycemic index is a value assigned to foods based on how slowly or how quickly those foods cause increases in blood glucose levels. The formulation is engineered to help manage blood glucose levels and can make up part of a balanced eating plan in the fight against Type 1 and Type 2 Diabetes. 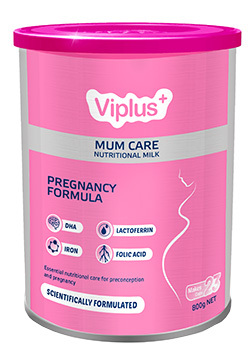 Viplus Premium M1+ Pregnancy Formula has been scientifically formulated using fresh Australian ingredients. It contains the essential nutrients you and your baby need during pregnancy including Folic Acid to reduce the risk of neural tube defects, Iron for energy and red blood cell production, FOS prebiotic to promote digestive health and increase absorption of Calcium and Vitamin D, and DHA to support brain development and cognitive function. 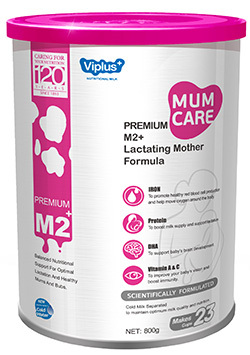 Scientifically formulated Viplus Premium M2+ Lactating Mother Formula is made using fresh Australian ingredients and a cold separation technique that preserves the goodness of real, natural milk. A low-fat source of quality Protein, it promotes healthy lactation and contains L-Carnitine for enhanced metabolic performance and DHA to support the development of your baby’s brain. Complete nutrition for babies between 0 and 6 months. 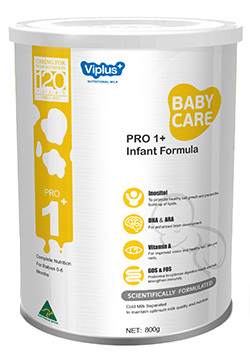 Viplus Dairy proudly produce Pro 1+ Infant Formula. It provides complete nutrition for babies between 0 and 6 months. The premium quality ingredients for our milk formulas are sourced only from Australia, mainly from the lush, rich, grazing farms of the South Gippsland region in Victoria. Balanced nutritional support for babies 6-12 months. Pro 2+ Follow-on Formula Baby Care includes 5 nucleotides, choline, calcium and DHA & ARA for enhanced brain development.The premium quality ingredients for our milk formulas are sourced only from Australia, mainly from the lush, rich, grazing farms of the South Gippsland region in Victoria. 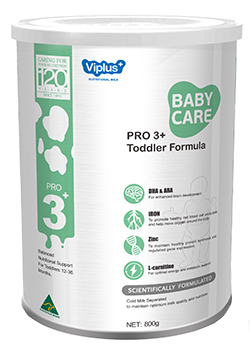 Viplus Pro 3+ Toddler Formula is produced using Australian ingredients and a cold-separation process to preserve the natural goodness of pure fresh milk. This clinically tested formula contains L-Carnitine for energy and healthy metabolism, Choline to support the brain and nervous system, prebiotics GOS and FOS to aid digestion and promote a healthy immune system, as well as five different Nucleotides to promote your toddler’s growth, development and immunity. 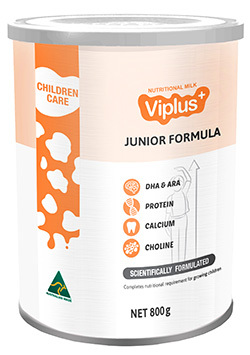 Viplus Junior Formula has been scientifically formulated using fresh Australian milk powder. It is enriched with natural high-quality protein and multi-vitamins and minerals. It is balanced nutrition for children's growth and development. The premium quality ingredients for our milk formulas are sourced only from Australia, mainly from the lush, rich, grazing farms of the South Gippsland region in Victoria. 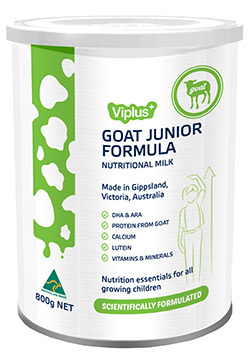 Viplus Goat Junior Formula has been scientifically formulated using fresh Australian goat milk powder with high quality formula to provide physical development for children. Viplus Goat Junior Formula aids digestion where bovine milk cannot be consumed. Its easy to absorb, non allergenic and provides a rich source of nutrition for children. This product is suitable for children over 3 years old. 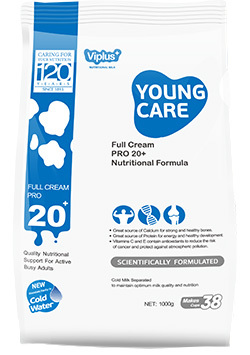 Viplus Full Cream Pro 20+ Nutritional Formula is made using Australian ingredients and a cold-separation process that preserves the natural goodness of pure fresh milk. An excellent source of Protein and Calcium, it can provide you with the energy and strength needed for a high-performance lifestyle. It dissolves easily in cold water and does not need to be refrigerated. 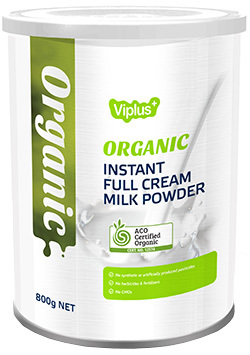 Viplus Organic Full Cream Milk Powder is certified through Australia A(Australian Certified Organic) an authority that governs the production of our product to ensure no synthetics , hormones or pesticides are used during the production process of our Organic Full Cream Milk. Additionally, our organic full cream milk provides all of the vitamins and proteins that non certified organic products do. A premium product for the consumer that is committed to consuming organic Australian products. 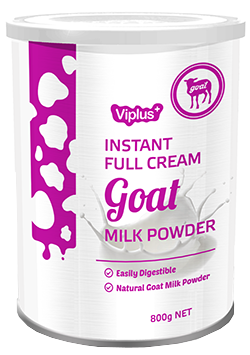 Viplus full cream goat milk formula is suitable for people of all ages, especially for people that find it difficult to digest bovine milk. This product is easy to absorb and is packed with minerals and vitamins essential for daily life. 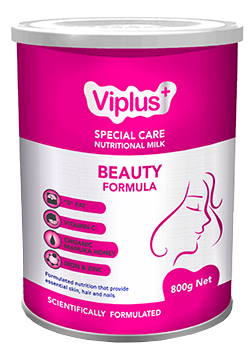 Our Viplus Beauty Nutritional Formula has been developed using fresh Australian milk. Contains Vitamin C which helps to neutralizes free radicals and helps keep skin looking younger. This formula contains Manuka honey which may aid in skin regeneration. 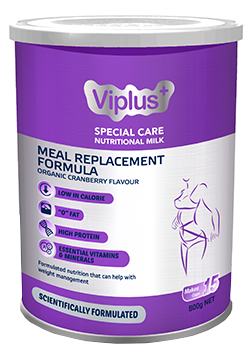 Viplus’s Nutritional Meal Replacement is specially formulated using Gippsland grass fed Dairy Milk. The formulation is a low calorie beverage that promotes weight management. The formulation is vanilla in flavour allowing other fruits and nuts to be added to fortify each serve with more vitamins and minerals if required. 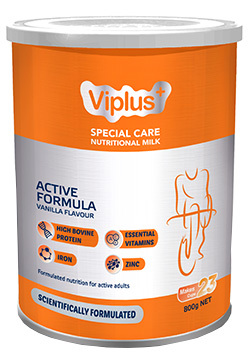 Viplus’s nutritional active formula is engineered using Gippsland grass fed Dairy Milk. The formulation is a high protein beverage that promotes muscle and cell rejuvenation after activity. The formulation contains essential amino acids to deliver energy pre and post exercise. ViPlus’s lactose-free milk formula is developed from Australian Gippsland sourced milk. It is formulated with an active ingredient which neutralises the effects of lactose in milk. Download our product and factory brochures or make an enquiry.